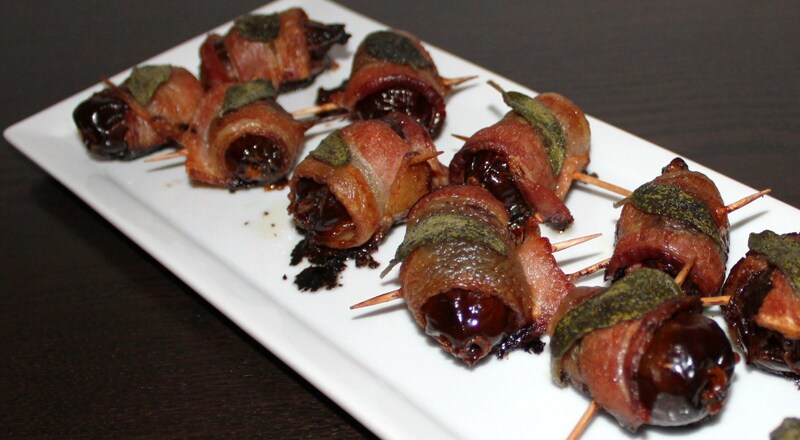 I’m trying to think if there is any easier appetizer than a Devils on Horseback…. With very few ingredients and time, you can assemble a sweet and savory appetizer that will make your guest marvel. These little snacks were devoured during cocktail hour leaving everyone wondering what exactly they were (dates and bacon). The hardest part of this recipe is pitting the dates – but a long skewer will do the trick in very little time. If only I knew they were called Devils on Horseback. Assembly: Preheat the oven to 400 degrees. Pit the dates using a wooden skewer. Cut bacon slices into thirds. Wrap a third slice around the date and secure with a toothpick. Dip the fresh sage leaf in oil and press it on top of the bacon wrapped dates. Bake at 400 degrees for about 15 minutes or until bacon is crisp. yum-o but still waiting to see the table decorations. Nice! and I can hear about it on Saturday! xoxox!